Here are some of the most Frequently Asked Questions our customers have about Replacement Windows, New Construction Windows, Window Installation and more! I've Heard that Marvin, Pella, & Andersen windows are the best. What are the differences? To make this simple, I am going to give you an easy to follow comparison of the most popular 3 lines we see in the Indianapolis, Indiana market. Marvin Ultimate Clad Collection vs Pella Proline (450 Series) vs Andersen 400 Series. Please read the full break down here! More and more homeowners, builders, architects & contractors are choosing fiberglass for their windows of choice. This is because fiberglass is a strong & stable component in all climates which makes it a popular option for windows. It doesn’t expand & contract like vinyl in hot and cold climates. It is extremely strong so it resists dents and damage to the surface. Fiberglass windows will generally cost more than vinyl windows in a replacement project. A Fiberglass replacement window project will cost anywhere between $800 - $2500/ unit installed. What is the difference between Integrity and Infinity Windows? Aren't they both made by Marvin Windows? This is a comparison you don’t generally see because both window lines are manufactured by the same company, Marvin Windows. There are, however, some notable differences between the two lines. Please read the full break down here! I cannot tell you how many times I have worked with homeowners and they are telling me all about their Sub Zero refrigerator and Viking Range for their new kitchen but are asking me whether it is worth it to pay a little more for the higher quality windows. Which do you think will be the easier and more cost effective to replace later if needed? If you are in the process of purchasing new windows or are just beginning to think about new windows, I am writing this for you. I want to give you as much information as I can about what windows cost and why there is such a broad spectrum of pricing. I would have to say that this is probably the number one question we get asked. Unfortunately, this is like asking, How much do cars cost? Find out what is going to work for you after reading this four part blog series. Which is better Marvin or Pella? That is a great question. If you are in the research phase of your window buying journey, you have probably heard of both brand name window companies. Both of these companies are large corporations whom have been in window manufacturing for a long time and have prominent names in the fenestration industry. Read about which is best for your needs. Vinyl windows will be your most cost effective option when it comes to replacement window projects, however even these have a wide range of costs. A vinyl window typically costs anywhere from $150- $2000.00 a unit installed. I realize that is a tremendously broad range and explains why so many people get really confused when comparing their window estimates or quotes. We are instructed to go out and get at least 3 different quotes to compare but then no one tells us how to read them or explain them to us. Even as a professional in the industry, I struggle to make sense of other competitor’s quotes or even to discern what is actually included in the quote. This is one of the greatest challenges when determining how to even decide what company to use for your window replacement project. This makes it really difficult to decide which quote is the best value for you as well. Follow these budget tips if you are starting to feel lost. Which fiberglass window is better: Integrity by Marvin or Pella Impervia? Fiberglass windows are one of the hottest trends in the window industry today due to the strength and stability of fiberglass, making it a great option to handle the outdoor elements. But are they all made the same? That is a top question if you are researching the different products and brands available in fiberglass windows. A couple of the most well know brands in fiberglass windows are the Integrity by Marvin product and the Pella Impervia product. How do these stack up against one another? Great question! Let’s find out! 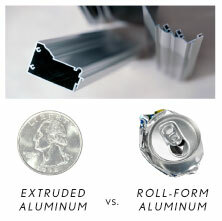 What is the difference between Extruded Aluminum & Roll Form Aluminum? On the other side of the spectrum, we have something called extruded aluminum. This type of cladding is much thicker, lasts longer and guarantees little to no water damage over time. Read about all the differences here! What I have recommended for people who are in the investigating phase of a window purchase is to really do your “due diligence”. Research the window products you are considering. Read reviews and blogs from local and national experts about the products specifically. Once you have researched the window brands and are confident regarding which window is right for you. It is time to start researching the window providers. If you are not sure which brand or product is right for you then discuss this with the window providers you meet with. Be honest about what criteria is most important to you. If you plan on selling your home in the next five years then it doesn’t make sense to put in triple pane windows because you will never recoup your up front costs. On the other hand, if you plan on living in your home for the next 30 years, you are better off to invest a little more in up front costs with a window that will last so you do not have to replace them again in 10 years. The more upfront and honest you are with your sales consultant, the more they will be able to direct you to the best fit for you. This is like going to the doctor and omitting important health information about yourself and expecting them to know how to treat you! Buying Replacement Windows can be very overwhelming and confusing because most of my clients do not understand windows or how windows are installed. Learn how to buy like professional builder. What are the different ways to install a window? Are you in the research phase of your window replacement project or are you ready to get this project started? Either way, we are here to consult and guide you. Even if we are not the right for you we can still answer your questions or help guide you in the right direction. So, how do you decide the best method for installing those replacement windows? Here are some pros & cons for the the different replacement window installation methods to help you decide.